Five Days for Five Years anniversary celebration. P.S. If you're interested in knowing the history of the Dog Days of Summer, read this article from National Geographic. P.S.S. 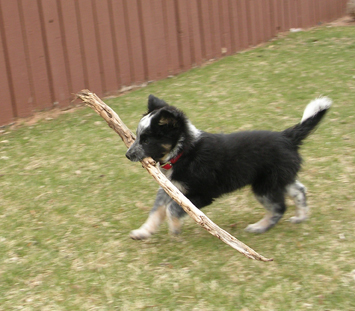 If that doesn't sound interesting, watch this very funny dog video instead. It has 34 million views on YouTube. Turn on your speakers. 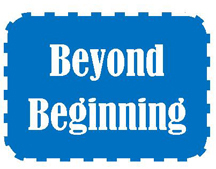 Beyond Beginning is a special sewing day for anyone who has taken Beginning Quilting at Cortez Quilt Company. We’ll help you choose a pattern for a quilt or other project and work with you as you get it well underway (then finish at home). This class will refresh your memory and boost your confidence. Karen Childress is your guide. 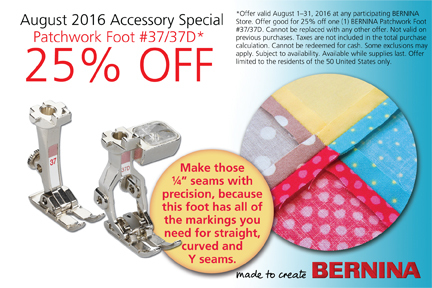 This month take 25% off Patchwork (1/4 inch) Foot #37 or #37D. For those of you with BERNINA 215, 330, and 350 machines who do a lot of piecing, this is a great opportunity to replace your snap-on sole with a full shank foot.